Directions: The Lake is about 61 miles north of Santa Fe. Take Highway 84 and turn left on Highway 96. 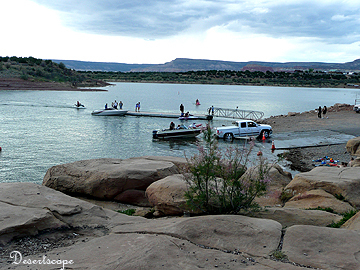 The Abiquiu Dam is on the left side of the road, while the campground, visitor center and boat ramp are on the right hand side of the road. This man-made lake was built and is maintained by the Army Corp of Engineers. It offers picnic areas as well, camp ground, fishing area and boating ramps for all water recreational activities. The cool maintain air and serene lake make for a perfect summer getaway. Our first visit to the area was July of 2009. It was a little after 3:00 when we arrived the Reina Campground. The first camp site we stayed was #25. The site is located in the middle of the campground. It has good shade and a picnic table with bench seats on either side. It also has a BBQ grill, a fire ring, and a lamp stand. The place was hot during the day, so we spent most of the day outdoors, visiting various places around the area, and having fun around the lake. At night, the place cooled dramatically and we were able to sleep comfortably inside of our tents. 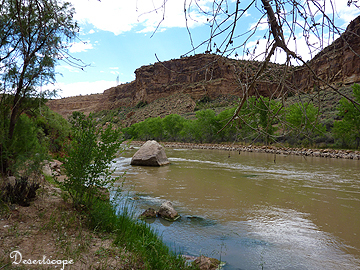 The second day we visited the Abiquiu Dam along the river bank. There were nice picnic areas along the way and families gathered around picnic tables. A few people actually swam in the shallow but fast moving water, which was a bit too quick and muddy to my taste. Along the road, we found a gopher snake lying on the side of the road. It had probably been run over and was slowly dying. Though it was engulfed by ants, it hissed at us when we walked by. The third day we moved to camp site #19. This site was truly beautiful. 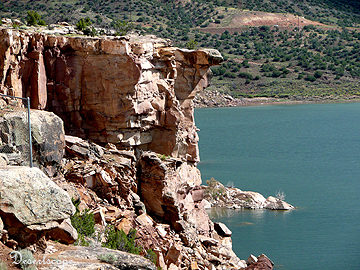 Facing the cliff that overlooked the lake, the site offers a panoramic view of the Cerro Pedernal (Flint Mountain) and the emerald green smooth surface of the Abiquiu Lake. The red rock formations around the lake gave a vivid contrast to the lake. As we unpacked, heavy clouds moved in and it began to rain. We fell asleep sitting on the lawn chairs while waiting for the rain to pass. In the afternoon, the sky cleared up and the air was clean and clear. The fresh scent of pine gave the place an air of enchantment. We crossed the road to a path that led us along the cliff. There were some really beautiful views. Finally we were able to get down to the bottom of the cliff from a relatively safer side. Here, while I gazed lazily at the smooth surface, the little guy was able to catch two medium-sized bass and my husband caught another. The sun began its retreat and I stood, mesmerized, listening to the soothing waves and watching the splendid display of sunset. Later, we cleaned and cooked the fish on the grill and ate them. Pretty tasty. The next day, we went boating along the lake surface. We paddled along the rock cliff and back. The water was cool as we jumped out of the boat. It was really an enjoyable trip, and we will almost certainly make the long trip back.